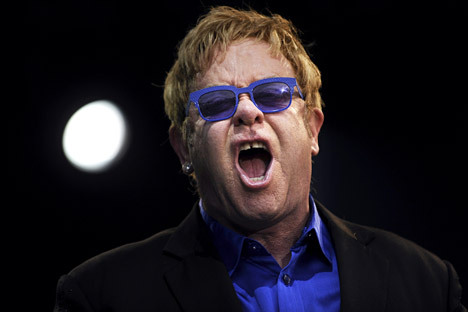 Rumors that Russian President Vladimir Putin had got in touch with British musician Elton John on Sept. 14 to discuss gay rights turned out to be unfounded – the phone call was a hoax by a pair of well-known Russian pranksters. British singer Elton John has been the latest victim of well-known Russian pranksters Vladimir Krasnov (known on the web as Vovan) and Alexei Stolyarov (Lexus). On Sept. 14 they spoke to the musician by telephone, pretending to be Russian President Vladimir Putin and his press secretary Dmitry Peskov, and saying that they wished to discuss gay rights with the singer, who has been critical of Russia’s controversial stance on the issue. "Thank you to President Vladimir Putin for reaching out and speaking via telephone with me today. I look forward to meeting with you face-to-face to discuss LGBT equality in Russia," Elton John wrote on his official Instagram page. "Putin did not speak with Elton John and most importantly, we never received any requests to meet," said Peskov on Sept. 16. Stolyarov explained that the idea to call the singer came after Elton John had met with Ukrainian President Petro Poroshenko and said that he would like to meet Vladimir Putin and speak about gay rights. "Knowing that our president was unlikely to meet Elton John to discuss this problem, we decided to play a prank on him." Furthermore, Stolyarov hopes that the singer, after understanding that he was spoofed, will not be upset but will laugh. In England pranks are not telephone hooliganism, they are a form of cultural heritage. Pranksters played a trick on excommunicated Ukrainian patriarch Filaret. The joker called the priest introducing himself as Semyon Semenchenko, deputy and commander of the Donbass battalion, and asked to be absolved of his sins. He repented and confessed. After the 2011 State Duma elections a prankster called Director of the Russian Central Election Commission Vladimir Churov and presented himself as the then-presidential adviser Arkady Dvorkovich, telling Churov that he would soon be dismissed. Churov, unaware of the joke, began to clarify the details. Belarusian President Alexander Lukashenko was also once honored with a telephone prank. He received a call from the so-called son of ex Ukrainian President Viktor Yanukovych, who asked if Lukashenko could grant him political asylum. According to the recording, the person with a voice resembling Lukashenko's agreed.